7 months ago today I had major surgery. 7 months ago today, my son breathed his first breaths. It’s kind of hard to believe that seven whole months have gone by, and at the same time, it feels like he’s always been with us. A lot of women say they don’t remember what life was like before kids. Not only do I remember, I am so grateful to know the difference. There was immense love before. Now, it is beyond measure. There was happiness before. Now, every single day is filled with a smattering of joy, if not buckets full. Evan’s personality is emerging in full force. He loves to blow raspberries, which can be a bit demoralizing when you’re doing something like telling him you love him, or why it’s important to have clean hands… and his response is a big ol’ PFFFFFT! He thinks Daddy is the funniest, but in the last week he’s gotten to meet for the first time, and spend a lot of time with his Uncle David (James’s younger brother) and Auntie Joanna (David’s girlfriend). We all went to the Florida Keys for a week, and I’m going to cover the fantastic resort we visited in another post, because just a few sentences here cannot do it justice. 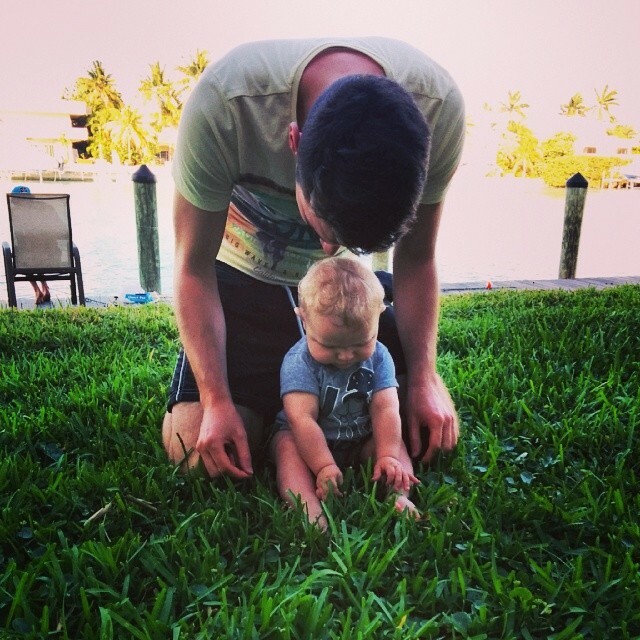 Evan sat in lush green grass for the first time, went swimming, and saw the ocean. I got to play with a dolphin named Pax, and James was happy to sit on the porch with a Corona and lime. Yes, we even splurged on limes! We went to eat at Blue Heaven in Key West thanks to a recommendation from my boss and friend, Eric. Eggs Benedict with Lime Hollandaise? Amazing. 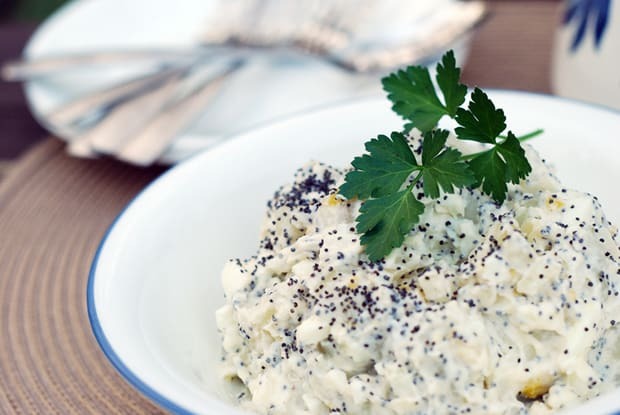 I don’t ever want traditional hollandaise again! Plus there are chickens and cats roaming the courtyard where you eat. How could you not love a place like that? Evan loved checking out the chickens, though he started crying when a rooster decided to crow at all of us for eating eggs. He’s sitting up all on his own pretty much all the time now. He still falls over, but it’s usually on purpose. He’s perfected the sitting-to-tummy move, and I’m sure it’s a matter of seconds before he’s crawling (God help me!). He’s also already perfected the toddler I’m-going-to-slide-down-your-body-so-I-can-go-somewhere move, but once he’s standing at your knees, he’s not quite sure what to do next. You can see the cogs working, and he’d honestly just like to take off from that position. 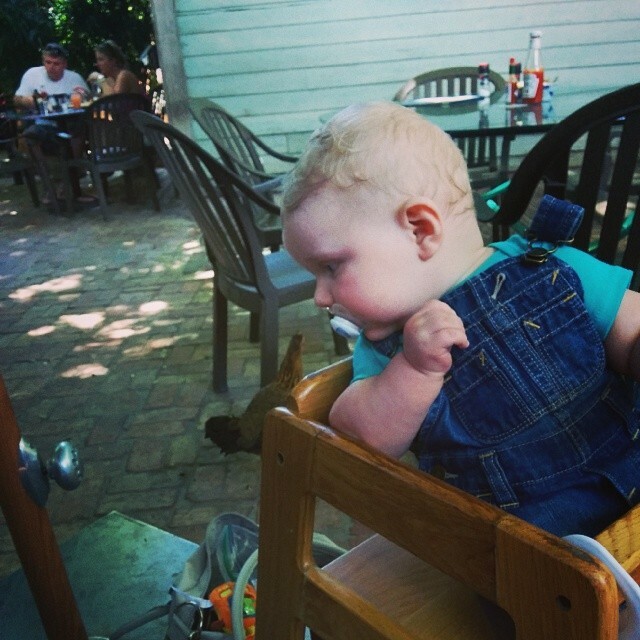 We’re still feeding him organic baby food pouches, but he’s moving beyond that to regular table food now too. We let him have whatever he wants from our meals. He’s a big fan of potatoes of any kind, and last night insisted on sharing my omelet. 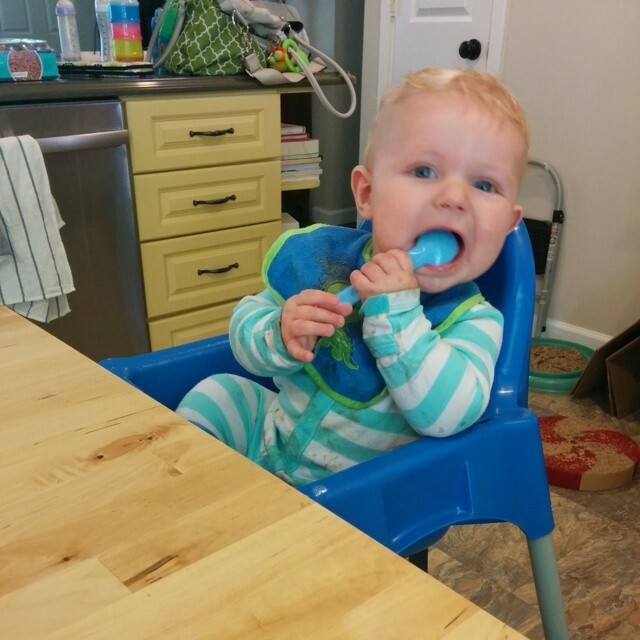 He’s also a huuuuuge fan of Stonyfield yoBaby Yogurt, especially sweet potato. He doesn’t seem to be deterred by anything but texture, and the faces he makes while chewing something for the first time has pretty much everyone in hysterics. I’m planning to do a Baby Essentials I Can’t Live Without list, but at the top of that list would be the Baby Merlin’s Magic Sleepsuit. I’ve mentioned it before, but this product has us incredibly spoiled. Evan has slept through the night for at least 10-12 hours since he was 9 weeks old, and takes at least 2 naps a day, for at least 90 minutes. I truly believe he’s as happy a kid as he is because of all the sleep he gets. It’s my go-to baby gift now. Giving the gift of sleep? Priceless. They’re spendy, so I only ever bought the 6-9 months size. I put him in it anyway, at 8.5 weeks old. His hands and feet barely came out of the ends at first, and he looked a whole lot like Maggie Simpson in her snowsuit. But he was safe, on his back, perfectly warm, and he slept. The suit looks warmer than it is because the outside of it is fleece, but please don’t let that deter you. We’ve haven’t had a sweaty baby out of this suit yet – just a happy one. Evan is “talking” more and more. Lots of babble that he’s VERY emphatic about. Nana and Dada have been said, but he doesn’t say them with meaning yet. And he absolutely adores his kitties. When Milo and Connor are in the room or meowing, he is absolutely thrilled. We thought Milo would be the more accepting of the two, but it’s been the exact opposite. Connor will let Evan grab his fur, and purrs the whole time. Milo runs in the other direction if Evan even looks in his direction. Smart, I think. Good practice for when he starts crawling. Evan’s favorite toys are a Taggies puppy we call Bronco after my sister’s dog, and “Eric” – a momma monkey from the Eric Carle collection (of The Hungry Caterpillar fame). And of course, his jumperoo. He’s on the highest level in the jumperoo now, and I dread the day when he’s too big for it. So that’s what’s been keeping me busy around here. What’s new with you? Disclaimer: There may be one or more Amazon affiliate links in this post. If you click on an affiliate link and then later purchase something from Amazon, this website may receive a few pennies in commission for referring you over. 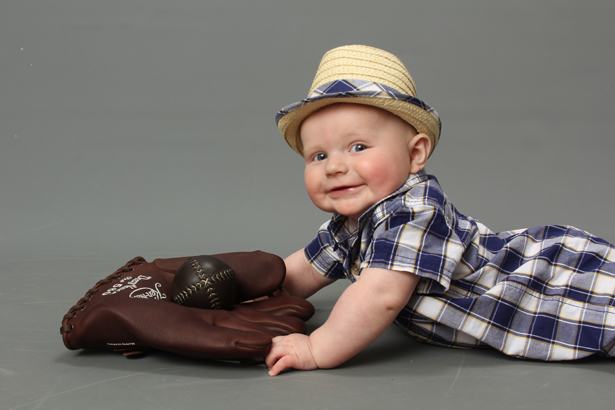 Amber-your little guy is absolutely adorable! Love those curls! All the new recipes look fab too ! Thanks for the pics. Yes, life is great with children! Your Evan is adorable like my 8 yr. old grandson, Evan. Both have handsome blue eyes and blonde hair! Enjoy your baby boy! So sweet, Anne. I can’t even imagine this kid at 8, but I’m pretty sure I’ll still be laughing lots. So LOVED hearing about your precious Evan who now has become my favorite Evan also!!! How adorably expressive he is plus he is HAPPY!!! He is so adorable!!!!!!!! Aww, thanks so much for your sweet comment, Baba. 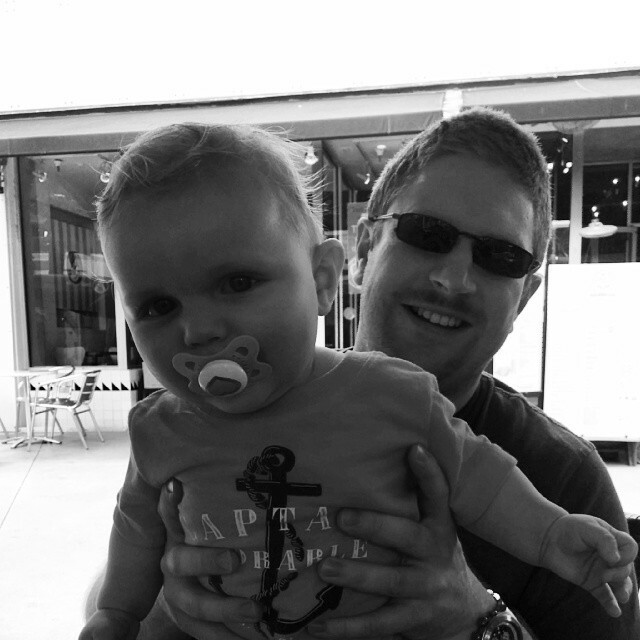 I’m so glad I got to meet this sweetheart at the bake sale – he really is such a happy baby! I’m gonna have to remember that Magic Sleepsuit for the future! 😉 Love the photos, God bless you guys. Love these pictures and what a great post! Thanks, Shelly! We need to get together again soon. Willing to come out this way for great Mexican food? I found a new place! Haha! Too funny, ‘tina. 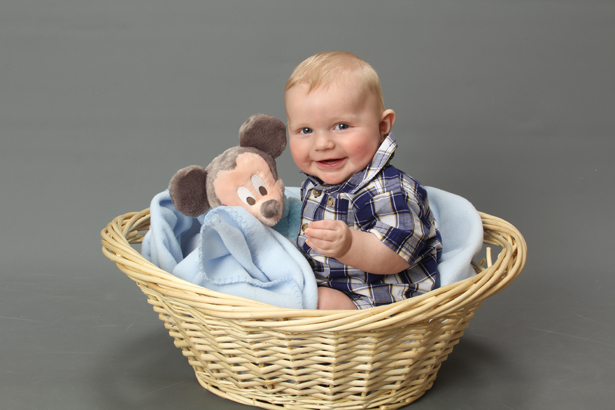 And of course – we’ve had that Mickey since before he was born, and his newborn photos featured it as well. It’s one of Evan’s favorite lovies. Love the update! Blue heaven is so good! We visit it every time we go to the keys! I must invest in one of these Merlin suits you speak of! Thanks, Katie! We’d been to the Keys before, but never Blue Heaven. It’s now on my must-do list every time we go. And the pancakes! Wowzers. You’ve really got to get a “super suit”, as we call it. Life changing. 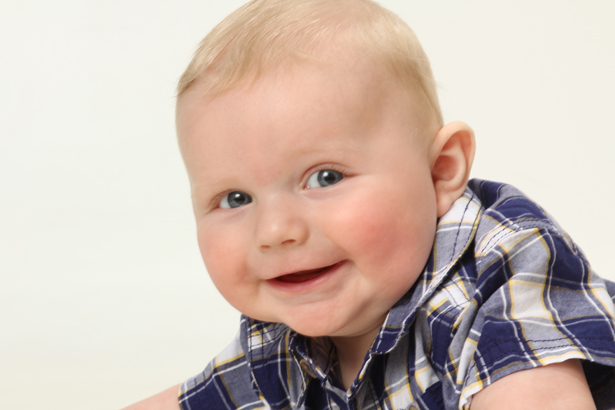 You can see so much of his personality through these pictures – he seems such a happy and jolly little boy. Everyone that meets him says that, Kathryn. He is just the happiest baby ever. And the sense of humour! He’s hysterical. We’re planning a trip to England, hopefully for August. I’m really hoping we can meet up, and you can see it for yourself.